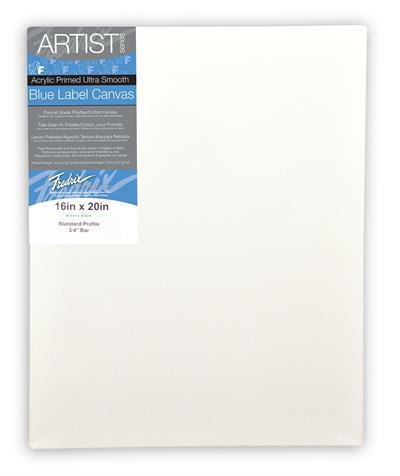 Fredrix Ultrasmooth Blue Label pre-stretched canvas is made of superior quality medium weight blended PolyFlax/cotton duck with fine texture for use with oils or acrylic paints. Ideal for portraits and other fine detail work. It is triple primed with acid free acrylic gesso. The canvas is stapled onto the back of standard stretcher bars. Paint on all four edges and hang it with or without a frame. *Sizes larger than 24x36 are unavailable for UPS shipping due to their size and fragility. Please call us at 813-989-0302 for more information or to discuss alternative shipping options. These sizes ARE still available in our physical store. Please call for availability.